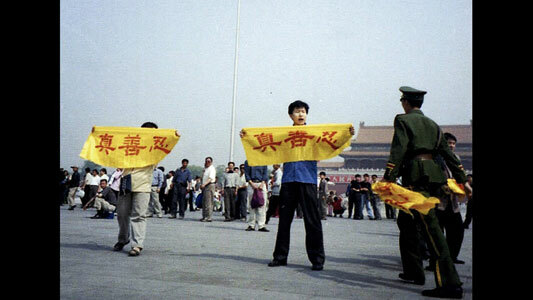 On the anniversary of the Tiananmen Square massacre, Dr Andreas Liefooghe of Birkbeck’s Department of Organizational Psychology explores the powerful message of the award-winning documentary Free China, and asks why the West lacks the courage to believe. For the first time, the service industry accounts for more than half of China’s economy, with manufacturing now accounting for less than 40%. Reports state that this is because of a burgeoning, and wealthy, middle-class doing what they do best: consume. Yet this is only part of a story. For every Vuitton bag sold (fake or otherwise), someone else labours not for a minimum wage, but for nothing at all. Beyond the glossy facades of Shanghai and Beijing lies the ugly underbelly of repressive China. The laogai system provides labour from ‘criminals’ and prisoners incarcerated for ‘crimes against the regime’ who need ‘re-education’. Those Homer Simpson slippers you are wearing may just be made by one of these prisoners, and perhaps it’s time to listen to some alternative account of China’s might. On the 24th anniversary of the Tiananmen Square Massacre, the documentary Free China: The Courage To Believe does just that. Following the lives of two protagonists, Free China tells the story of Jennifer, a mother and former Communist Party member, who along with more than 70 million Chinese people, was practicing a belief that combined Buddhism and Daoism, until the Chinese Government outlawed it. The Internet police intercepted an email and Jennifer was imprisoned for her faith. As she endured physical and mental torture, she had to decide: does she stand her ground and languish in jail, or does she recant her belief so she can tell her story to the world and be reunited with her family? A world away, Dr. Charles Lee, a Chinese American businessman, wanted to do his part to stop the persecution by attempting to broadcast uncensored information on state controlled television. He was arrested in China and sentenced to three years of re-education in a prison camp where he endured forced labor, making amongst other things, aforementioned slippers sold at stores throughout the US. As political scandals surface and tensions rise, along with more than one hundred and fifty thousand protests occurring each year inside China, this timely documentary highlights the issue of unfair trade practices with the West, organ harvesting of prisoners of conscience and widespread forced/slave labor. The film also highlights how new Internet technologies are helping to bring freedom to 1.3 billion people in China, and other repressive regimes throughout the world. Free China also has another aim. It has partnered with an internet technology team, who have developed new peer-to-peer software, which allows users inside China to safely and securely breakthrough the Great Internet Firewall, and access uncensored information. This is hoped to allow Chinese people with alternative sources of information, to be able to make more informed decisions about their own future, and to help transform ‘China-net’ from a tool of control and oppression into one of freedom of expression on the world stage. This week from the 4 June people can buy DVDs of the film, plus there will be theatrical releases in New York and Los Angeles, as well as a series of international screenings. Despite high-profile endorsement, very little is heard of this story. As we continue to court China for its economic power, perhaps we also need to check our courage to believe some alternative accounts. Free China was screened at Birkbeck on 18 March 2013 as part of the Vulnerable Selves, Disciplining Others ESRC Seminar Series, examining the relationship between vulnerable individuals and oppressive regimes. We were joined by the producer Kean Wong, protagonist Jennifer Zeng, and interviewee Ethan Gutmann, and became part of a list of screenings alongside US Congress and EU Parliament. Category: Business Economics and Informatics Tags: China, documentary, oppression, Politics society and law, Tiananmen Square by Bryony. Please provide some information about the movie “Free China” is(was or will be?) nominated by Oscar. Yes yes yes…we cannot continue to turn a blind eye to these atrocities just because our we and our country could benefit financially, otherwise we are morally corrupt, having lost touch with our true humanity… Courage to Believe in what is right and good. What an eye opener!! “The Courage to Believe” is an enormous insight into China’s barbaric secret. I hope everyone will take the time to watch and listen to this very powerful message so the world will awaken to the truth to have compassion for those voices who are not heard. We all need to see this film. We hear ‘never again’ often, this film illustrates really candidly that atrocities are occurring under our nose.